No one likes road construction. It backs up traffic, sends dust everywhere, and has the potential to send gravel pellets toward windshields at an annoying rate of accuracy. But construction zones should give drivers a lot more to consider than the potential damage to vehicles or inconvenience to timelines and travel; because the fact is, the safety of construction workers and drivers alike is imminently more important than these other factors. When a work zone collision produces serious consequences, consulting a local personal injury attorney would be a good idea. A June 2018 accident on the Orange County Florida Turnpike brings home this reality. One woman was driving when she crashed into a man lift in the construction zone. The woman then rammed into a concrete barrier, and was killed. A man who was on the lift, experienced critical injuries and a passenger in the vehicle suffered serious injuries, as well. More than one in five accidents that resulted in serious injuries and/or fatalities were related to distracted drivers. 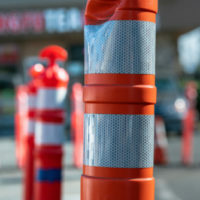 The dollar amount connected with every construction zone injury is estimated to be over $40,000, according to the US National Institutes of Health. They put the cost of fatalities at $4 million. OSHA, however, puts estimates significantly higher, at $62,000 and $8.7 million, respectively. Undeniably, the emotional costs to victims and their families are impossible to describe. Exercise patience: Workers are trying to make road improvements, not trying to cause you any inconvenience. Anticipate delays and give yourself plenty of time to get where you’re going. Use your turn signal: Give other motorists a minimum of three seconds with your blinker on before attempting a lane change, and then use your mirrors and check your blind spot before proceeding. Slow down: Don’t ignore reduced speed limits. Be alert: Don’t let distractions lead you to become another statistic in a construction zone. If you or a loved one is the victim of a construction zone accident, you deserve to have the experienced and assertive legal team at the Law Offices of Robert W. Elton on your side. If a reckless or negligent motorist caused significant injuries or death, we will provide tenacious representation to achieve the best possible results for you. Contact us in Daytona & Ormond Beach today for a confidential consultation.